Downloading videos from various sites like YouTube may seem easy as there are a bunch of free video downloaders and converters online. Well, it may seem that way until you realize that the quality of the video you downloaded isn’t as clear and as good as the original. If you’re someone who regularly downloads videos online, you might as well consider getting a good video downloader. Speaking of which, it’s time to find out if KeepVid Pro  can get the job done. KeepVid Pro is basically the desktop version of KeepVid. As already mentioned in my previous review , the online version of KeepVid has its limits like the lack of ability to download higher quality video formats. So if you want to download 1080p/4K videos or even 256Kbps MP3 files, you need to purchase the Pro version. With the Pro version, you can also take advantage of its other premium features like downloading playlists, converting local videos to any format, recording videos from any website, transferring videos to Android/iOS devices and up to 3x faster download speeds. 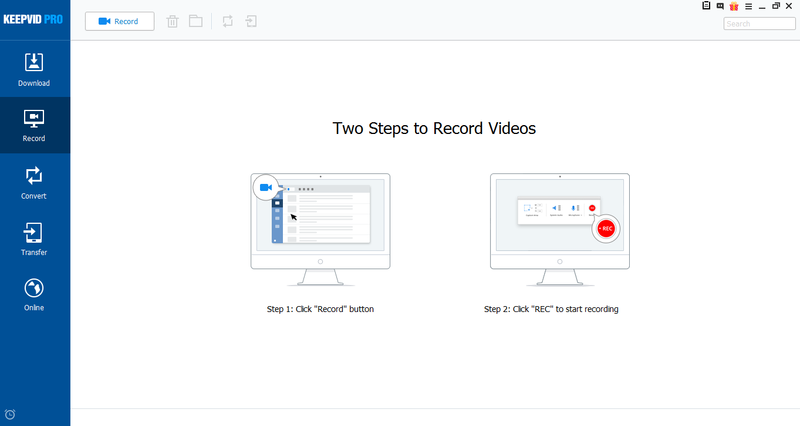 KeepVid Pro is compatible with both Windows and Mac. Stable, responsive and neat UI. User-friendly – new users won’t have a difficult time figuring out how the desktop app works. It flaunts a very straightforward menu with properly labelled options. It offers more value-added features. It’s not just for downloading and converting videos. You can use it to record videos and even transfer your downloaded videos to your Android or iOS device. 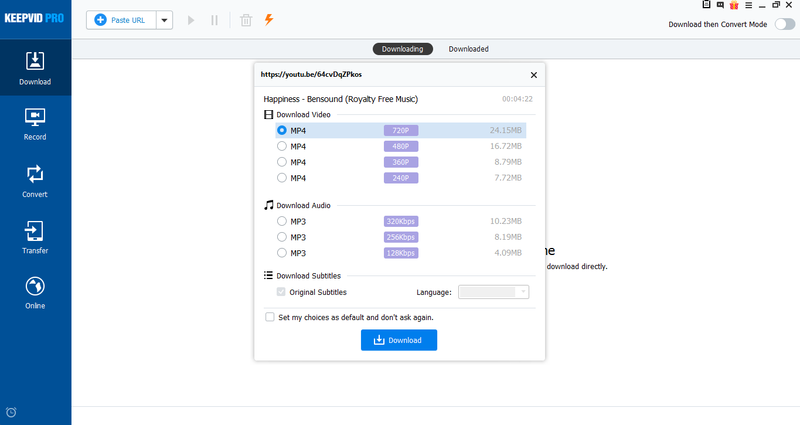 Offers 3 quick and easy methods to download videos – you can either click the download button that sits right on top of the video or simply copy the video URL and then use the “Paste URL” option. Alternatively, you may also choose to directly record the video from the screen which is ideal for recording livestreams. Has a Turbo Mode which enables you to download videos at 3x faster downloading speed. You can download YouTube videos with subtitles. You can download playlists of the same category from sites like YouTube and Lynda. It has an integrated browser which lets you search, watch and download videos right within the desktop app. You can convert your downloaded videos or any local video to any format that you want. KeepVid Pro supports the conversion of any video to 150+ different formats including MP3, MP4, AVI, FLV, 3GP, MPEG, M4A, WAV, etc. You can also optimize the output video based on the platform or device. It has a Task Scheduler which lets you download up to 10 videos simultaneously and assign tasks. Download any video from any site of any format without limits. You can download videos from sites like YouTube, Facebook, Vimeo, DailyMotion, Tumblr, SoundCloud, etc. You can save these videos in standard or high-quality formats including 1080p and 4K (Ultra HD). The online version of KeepVid may be free to use but it cannot cater to users who are looking for more advanced options and features. This is where the desktop version of KeepVid comes in, the KeepVid Pro. With Pro, you get to do more than just download videos and convert them into MP4 or MP3 files. You can also use Pro to record videos from any website which is perfect for recording livestreams. Moreover, you can use it to transfer the videos you downloaded to another device like a smartphone or tablet. It’s not just that, KeepVid Pro also lets you download multiples videos at once which greatly helps cut down the downloading time. You can also enable its Turbo Mode so you get to download videos at 3x faster than the usual. Clearly, KeepVid Pro offers more functionality compared to free online video downloaders. Even so, it manages to deliver a user-friendly vibe. It won’t give users a difficult time figuring out how it works. To get started, you are given 3 basic options. First, you can choose to use the desktop app’s integrated browser and simply search for the video that you want to download. Once you find the video, simply click the blue “Download” button that sits right on top of it, choose your preferred format and that’s it! Another option is to find and open the video externally using your default browser or any preferred browser. You then copy its URL. 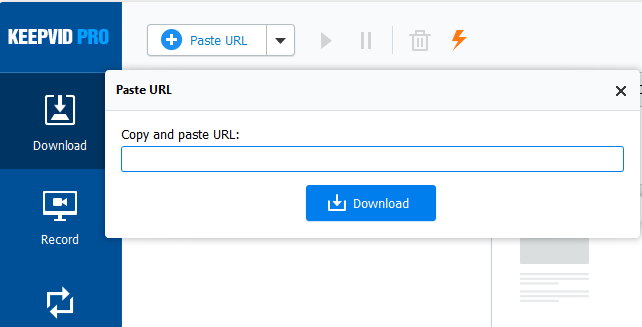 Once copied, you go back to KeepVid Pro, make sure the “Download” option in the main menu is selected, click the “Paste URL” button and then simply paste the URL on the field provided. Click “Download” to confirm. As for the third option, you must choose “Record” from the main menu and then go to the video that you want to record. Set your desired dimensions then press the record button. Just click the stop button to finish recording. This option is not only great for recording livestreams, you can also use this feature to record screen activity so it acts like a screen recorder. When it comes to quality, you can certainly expect high-quality videos and clear audio files. Even the recorded videos are clear and you can expect very minimal loss of quality compared to the original. Not only that, you can also configure KeepVid Pro to directly download videos from your preferred web browser. So whenever you stumble upon a video that you wish to download, just click the “Download” option right below it. The download task will be automatically shown on KeepVid Pro. Performance wise, it performs really well. It doesn’t lag or crash, even during multiple downloads and file conversions. Another great thing about it is that you can customize its settings to match your preferences. All in all, this desktop version of KeepVid proves to be a handy tool not only for downloading videos but also for other related tasks like video recording, conversions and media transfers. The free online version of KeepVid is more ideal for users who downloads videos on a casual basis. KeepVid Pro, on the other hand, is a better choice for users who are regularly downloading videos and music files online. It definitely qualifies as your “go-to tool” for downloading videos especially if you want high-quality (1080p or Ultra HD) video formats. Since it’s a desktop app, it’s very accessible so you can use it anytime. For its price, which is roughly $30 for a 1-PC personal lifetime license, it’s definitely worth checking out!